Louise is the founder of Levy Tree Care. Since graduating from Carleton College in 1989 Louise has worked as a graduate research assistant in Oregon and Alaska, served on the City of Duluth citizen Tree Commission, worked at the University of Minnesota Cloquet Forestry Center, and assisted Duluth with its tree inventory and tree planting program. Her experience in traditional and urban forestry gives her a well-rounded perspective on trees. Austin is from Coal Vally, Illinois, where he learned the reward of a hard day’s work by milking on his family’s dairy farm. Out in the fields of the farm, hunting deer, and casting for that trophy fish, he developed a passion to serve and protect the environment. Austin attended Vermillion College in Ely, Minnesota. While attending Vermillion College, he spent his summers working as a Park Ranger serving for parks near and far. He worked for Inks Lake State Park in Burnet, Texas and, more locally, for Tettegouche State Park in Silver Bay, MN. In 2017 Austin graduated from Vermillion College with his Associates Degree in Wilderness and Parks Management. 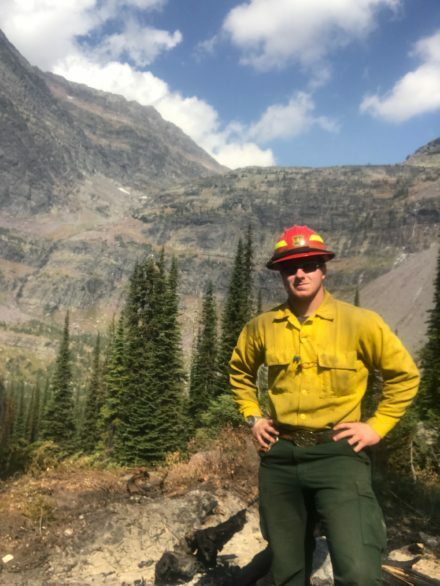 After school, Austin served as a wildland firefighter stationed out of Ely, MN; where he served on two large fires in Montana, the Sprague Fire, in Glacier National Park and the Lolo Peak Fire, in Lolo National Forest. Austin joined Levy Tree Care in the Fall of 2017. He wanted to work for LevyTreeCare because he could tell that the company pays attention to the safety of its employees and invests in their professional development. His interest in tree care comes from a passion to not only take care of trees, but to also maintain an active lifestyle in the outdoors, to gain knowledge, and experience that comes with tree care. Austin spends his time as a hobby carpenter and volunteer firefighter. When not in town you can find Austin hunting, fishing, and camping in the great outdoors of Minnesota. Stihl or Husqvarna – Stihl, he owns one, why would he choose another. Emily is originally from the Twin Cities, but spent most of her summers in a small town called Jacobson, Minnesota, at her grandparents farm. There she was taught how to identify most northland trees from the roadside. Her grandfather had planted pines and spruce stands for each year that a grandchild was born as well hundreds of acres of hybrid Poplar for the paper pulp companies. She grew up digging in the dirt, be that in her mother’s vegetable garden or up north at the farm. All of this was fitting for her 2014 Bachelors degree in Geology from Gustavus Adolphus College. 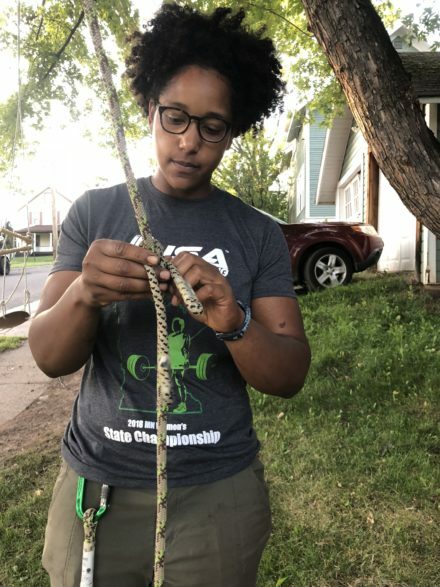 After earning her degree Emily moved to Duluth and landed a job with the University of Minnesota Duluth as a temporary Horticulture Field Biologist for Project Baseline. Through that position Emily became extremely fond of the small percentage of native and restored prairie-land left in the United States. Shortly after her time with the University, Emily was hired on at the Glensheen Mansion in Duluth, Minnesota as the Head Gardener. There she is in charge of everything from the soil below the blades of grass to the very top of the tallest tree. After meeting Louise Levy at a tree pruning workshop, Emily knew that she wanted to work for Levy Tree Care. The intricacies of pruning shade trees peaked Emily’s artistic and scientific interests. Two years later the desire came to fruition. Emily is working a 3 month stint with Levy Tree Care in her off season from Glensheen. During this time she will work as the grounds crew, pulling brush and bucking limbs, as well as gleaning all the techniques of pruning, climbing and knot tying from the rest of the staff. This particular evergreen conifer is a bit of an odd duck, which I can relate to. The silvery blue hue on the lush needles makes this tree stick out in the middle of a mixed forest, even a forest of mixed conifers. There is also a hidden secret to these trees; its holds an extra bit of fun. If you snap the needles and give it a smell you will find a citrusy aroma. A tree of many talents and quirks. 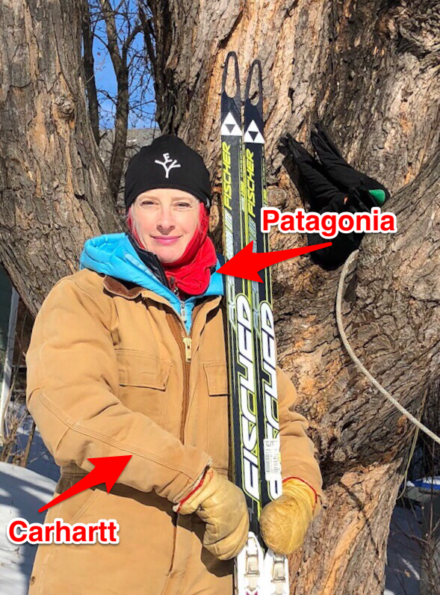 Patagonia or Carhart – Here’s the deal. If it works, it works. Stihl or Husqvarna – Again, if it works it works. But Stihl has generally worked well for me.